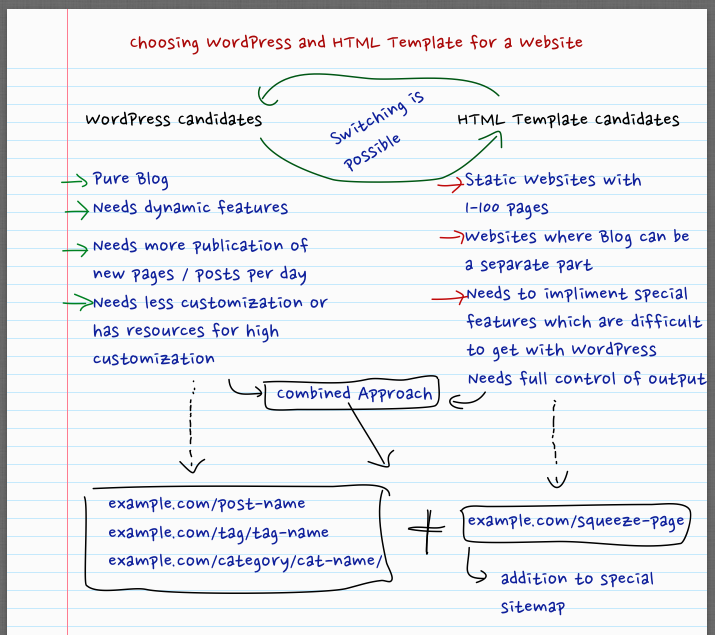 Choosing WordPress and HTML Template for a Website is not really that easy that it might sound. This quite difficult as both has limitations of their own. Unlike Drupal, Magento; anyone now claims own self as WordPress developer. Whereas the real good WordPress developers are limited in number, their fees are higher and unfortunately they have the biggest issue of time – less number of efficient person but the demand is more. This Choosing WordPress and HTML Template for a Website is a kind of guide article that will help from a new blogger to a small business owner. Testing various kind of plugins on real online WordPress website and deactivating them. This is serious issue that practically needs correction after 3-4 years run. Thats what we wrote the video guide on how to remove WordPress Plugin From Database. Its difficult. Kind of Hybrid Website where there is need of automated functions – this is the niche which is actually confusing. Both WordPress and HTML or PHP works fine – but who is running is the question. WordPress basically a kind of Web Application. Google bot considers WordPress a bit different from a Static HTML Template based Website. The biggest advantages are adding site-wide changes, having the advantages like Feed Generation, advantages of Plugins like creating a contact form without any knowledge, creation of XML sitemap and actually the list is non ever ending. WordPress is a PHP-MySQL based web application. It demands a good backend support. It is definitely easy to hack a MySQL database via various methods from front end that a flat HTML website. A HTML website virtually can be hosted on anywhere – you can host on free Dropbox. This is not an universal example but this matters when either the budget is less or there is change of getting a huge number of PageViews. Ultimately we render the WordPress posts to HTML pages as Cache for faster delivery. Management part goes easiest with WordPress. Practically these issues are not of WordPress but of the technologies behind. Choosing WordPress and HTML Template for a Website needs a good consultation with an expert if the project is serious. Both converting WordPress to HTML or PHP pages or vice versa is possible, an expert actually can set the targets, create the URLs in a future proof way. Its not really easy to answer to the webmasters who belong to the third point – “Kind of Hybrid Website where there is need of automated functions”. We can use HTML or PHP with WordPress, this thing we frequently do, specially on the websites which demands coding, examples etcetera. Category page is infamous part of WordPress – its quite difficult to get the thing you want. On the other hand, its possible to call a WordPress or PHP function on HTML page within the domain of installation. By the way, from SEO point of view, now possibly its easy to think of a HTML website (as modification of individual page is possible) for implementing hundreds of crazy experimentations, rules etcetera if the Web site is very small. Content is King if you have less dependent on G Products, it is difficult to predict their business strategies, obviously they will never say it openly. The chance of fall in SERP is higher in WordPress – just few changes in Plugin can change the output. We think, one can consider to flatten older WordPress posts to HTML pages for better management. That actually give the database a kind of relief. This Article Has Been Shared 4475 Times! Rich Pins has been introduced by Pinterest. Here are the easy ways how you can use for WordPress to validate your rich pins and apply to get them on Pinterest. Icon-Font is Icons but is in Font format – that simply means, what you used commonly as image and increased your page loading time can be reduced and made cool. Cite this article as: Abhishek Ghosh, "Choosing WordPress and HTML Template for a Website," in The Customize Windows, July 25, 2013, April 21, 2019, https://thecustomizewindows.com/2013/07/choosing-wordpress-and-html-template-for-a-website/.